On one side we see an image of an angel appearing to bring water to Hagar & Ishmael who, after their expulsion from home are wandering the dessert thirsty for water. (Genesis Chapter 21 verse 17-19.) At the bottom right hand side of the print is the inscription "Leeds Pottery". On the reverse side is a print of an angel appearing to Abraham as he is about to sacrifice his son Isaac. Teapot, creamware, with ear-shaped handle, the spout with acanthus leaf molding at the base. The cover has a flower knob and black prints of a long trailing floral spray. 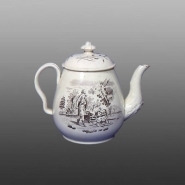 Each side of the teapot is printed in black with a different biblical subject from Genesis. On one side we see an image of an angel appearing to bring water to Hagar & Ishmael who, after their expulsion from home are wandering the dessert thirsty for water. (Genesis Chapter 21 verse 17-19.) At the bottom right hand side of the print is the inscription "Leeds Pottery".